In honor of Valentine’s Day, and because there will likely be many roses sent and received for this special holiday, we thought we’d give you a bit of rose trivia to celebrate. Roses are universal symbols of love. Most everyone knows that roses represent adoration, desire, friendship, and other forms of love that one person can have for another. But, roses offer more meanings and they come with some interesting stories. The following are some pieces of rose trivia we thought you’d like to know about. People have loved roses since nearly the beginning of humanity. In fact, it’s thought that the floors of Cleopatra’s palace were decorated with carpets of rose petals. The wise Confucius even had a library specifically dedicated to books on roses. He had more than 600 volumes in it! “A rose by any other name would smell as sweet.” We agree, Mr. Shakespeare. 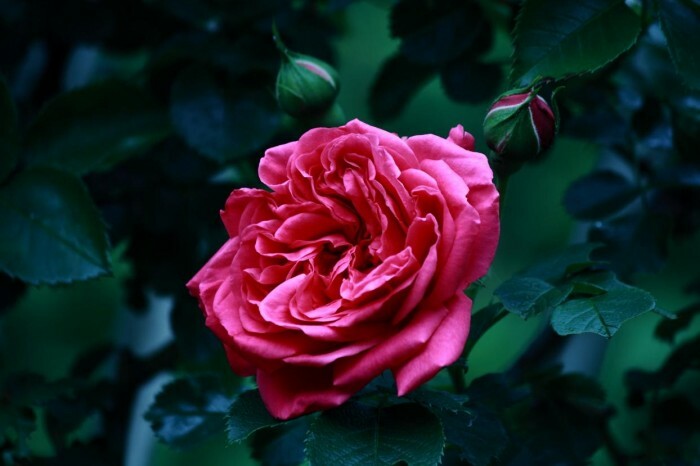 William Shakespeare refers to roses more than 50 times throughout his brilliant writings. The world’s oldest living rose is said to be 1,000 years old. It lives today on the wall of the Hildesheim Cathedral in Germany. The mystery of, and the love for, the white rose began in the age of the Romans, when they believed that white roses growing wild were the tears of Venus that had fallen as she mourned the loss of Adonis. Most people associate New York with the moniker “The Big Apple” or the giant crystal ball that falls in Times Square every New Year’s Eve. But, the official symbol of New York is the rose. It’s the state flower. Country music star Dolly Parton has a rose named after her. It’s a beautiful orange-red variety that looks gorgeous on its own or in multi-flower arrangements. According to Greek mythology, Aphrodite gave the rose its name. The rose is a beautiful, mysterious, and popular flower that has withstood time and seems like it may outlast much of it. The next time you hold a rose in your hand, think about the people that have also experienced the wonder of the rose and the way the flower links all of us together with its beautiful presence. In honor of Valentine’s Day, and because there will likely be many roses sent and received for this special holiday, we thought we’d give you a bit of rose trivia to celebrate.Roses are universal symbols of love. Most everyone knows that roses represent adoration, desire, friendship, and other forms of love that one person can have for another. But, roses offer more meanings and they come with some interesting stories. The following are some pieces of rose trivia we thought you’d like to know about.